The Post and Telegraph Office was built at a cost of ₤1,643/18/5 and opened on 2 March 1897 by Post Master General, The Hon Joseph Cook. The Post Office closed in 1994 and is now in private ownership, the building is classified by the National Trust. The first post office was gazetted 1st January 1866 when the town was called One Tree Hill, the first Post Master was William Pettit, who was succeeded by William Avery on 1st July 1867. 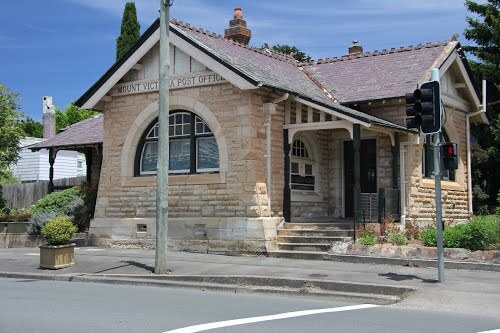 From 1st January 1870 the Mt Victoria Railway Telegraph Office was amalgamated with the One Tree Hill Post Office. The new Postmistress was Mrs Mary Mackel, wife of the local station master, she was employed at a salary of ₤25 per annum. The separate locality names for the post and telegraph offices continued. On 10th November 1875, Charles William (Karl Wilhelm) Prott took charge of both offices with a postal salary of ₤29 and a telegraph salary of ₤25, per annum. Prott was a keen sportsman and founder of the Mt Victoria Rifle Club, a man of forceful temperament and military bearing, he was known in the town as Bismarck. In 1876 the locality names of both the post and the telegraph office were officially designated Mount Victoria, and in 1885 the combined salaries for Charles Prott increased to ₤230 per annum. On 6th June 1895 F J Burnett was appointed Post Master on a Salary of ₤260 per annum, although in 1896 the Post Master General’s Department deducted ₤40 for living quarters in the new building. Following Federation in 1901, Post Master Burnett was succeed by R Finney (1906), A E Parker (1908) and D S Strickland (1914), at this time Sunday morning mail delivery over the counter ceased and the post master could enjoy a complete day of rest like other members of the community. S W Cambridge (1916), at this time the winter coal allowance for heating the office and quarters was 10 tons delivered from the Megalong Colliery at 17/6 per ton. C M Ireland (1918), T W Smithson (1928), Henry James Hughes (1940), James Goodwin Macdonald (1942), Kenneth Richardson (1944), A V Lindsay (1952-1961), E J Hammond (1962), Patrick Ian Merrick (1972), Doris Jean Lindsay (1979-1994 when the post office closed). The first postman appears to have been William Clee, who signed the declaration of secrecy in 1941, he was succeeded by Ronald Maxwell Clee aged 15 years on ₤104 per annum (1945), then Carl Campbell Smith (1948). Other postal assistants in the 1940s were Miss Winn, Miss A Ottey, Bartholomew Moran, Mrs Laurie Peck. A G Wright was postman until 1949, followed by Bruce Noel Goddard and Thomas Edmund Wilson (1950). Post Master General Joseph Cook approved the plans in February 1896 and a tender of ₤1239/19/- was accepted from W B Chesell. Further additions were approved, including a battery room to power the Morse equipment, fuel shed, servants room, fencing and site works. Furniture included pigeon holes, stools, coal scuttle, ink stands, door mats and linoleum, to a total of ₤1,643/18/5 when the building was opened by Joseph Cook on 2nd April 1897. In 1898 the Railways Department purchased the former battery room from the old site, and drainage and roof leaks were rectified. On 10th April 1906 a shed for the postman’s horse was completed at a cost of ₤36/15/-. Sources: Australia Post Historical Section, Local Studies files.